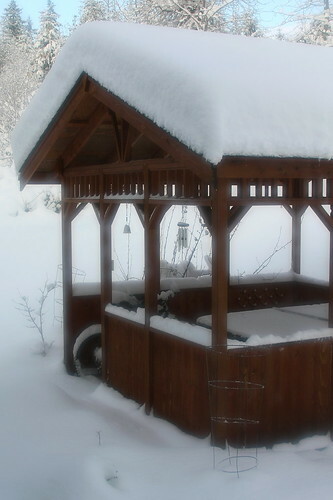 Gazebo in snow, originally uploaded by The Bacher Family. We had an amazing amount of snow in Eatonville before Thanksgiving this year--a foot and a half on the ground around our house!--and it made for some great photos. I shot this one looking out the back door at the gazebo, and didn't realized until I had the photo on the computer that the window (which must have been just slightly fogged) had acted as a beautiful soft-focus filter. I love the effect.